As a somewhat ambivalent user of a Lenovo Thinkpad T460s laptop loaded with Windows 10 Enterprise and latest updates. 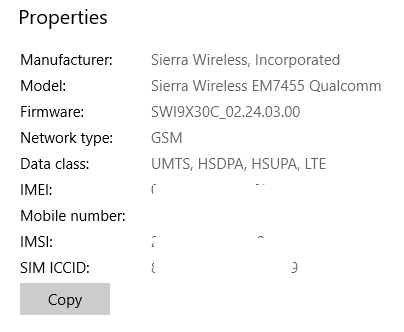 After the Fall 2017 Creators update from Microsoft, the built in 4G Modem, a Sierra Wireless EM7455 stopped working. But not in an obvious way. You could still connect the 4G modem, and you’d have “bars” as usual. After the connection was established however, you’d notice that you couldn’t ping or browse any websites. Ping resulted in “General Failure” and browsing usually ended up in some ambiguous DNS type error. First I thought it really was DNS, just misbehaving and not resolving things. But then again… ping to IPs didn’t work either. I stopped using the card entirely; relying entirely on the wireless hotspot from my cell phone for mobile connectivity on the road. I would google the issue every now and then and see if there maybe was a firmware update which would finally fix things. No joy. Finally, I ended up on a Lenovo forum where the issue was being discussed. Someone had found a workaround, and it actually worked! The short of it is: If you want to use your 4G card on the road, you need to disable all other network cards, wireless and wired. Then connect the 4G and it’ll work like normal. echo "Disabled Wi-Fi and Ethernet adapters. Enabling and connecting cellular modem..."
Since it’s quite annoying to have to manually disable and enable individual cards, I made a small Powershell script for disabling and enabling things. They are below. Feel free to use them if they feel useful to you. v. 2.0 might somehow detect that I’m no longer docked and disable the ethernet and wifi, but then again, sometimes I’m on wifi, and sometimes on 4G, so that logic doesn’t work in every case. This first script disables all Network Adapters called Wi-Fi and those starting Ethernet. Then it waits for a while in case disabling takes a while, and then enables the card called Cellular. In case your adapters are called something else, change those. You can find the name using: Get-Netadapter. Look for the Name-column. Note that you need to run the scripts as administrator for them to work. This second script does the reverse. Save as powershell script (.ps1) files and run when needed. echo "Enabled Wi-Fi and Ethernet adapters. Disabled cellular modem..."
Note that connecting the cellular modem via the netsh command requires that you’ve have a named connection profile. Depending on your settings, you might have one already. You can list existing profiles using netsh mbn show profile . Here’s an example XML file which you can use. Remember to save as .xml, not .xml.txt or some such. Also, I’ve just noticed that Lenovo is pushing (well it’s not forced, but through their System Update utility (sidenote: probably the only lenovo utility which I absolutely recommend having on)) “Sierra Wireless EM7455 Software – 10 , version 7.53.4795.0101 with the following changelog note: “New Functions or enhancements: Maintenance Release”. In other words, fat load of nothing in terms of information regarding what this update actually does. Thanks. I’ll test it and let you know if all my precious work on the workaround has been for naught. Edit2: The firmware was updated along with the Sierra Wireless Software v. 7.53.4795.0101 package from Lenovo System Update. The firmware is now listed as: SWI9X30C_02.24.05.06, so the last two number-series have been incremented.